Coco wasn't waiting for me there when I got home, of course, but when I went in to fetch the camera and the Felcos (to clean up the Japanese maple) I brought her out front with me as well. When Coco is in the front yard, the lions watch over her and she's free to roam in a dog-proofed area. 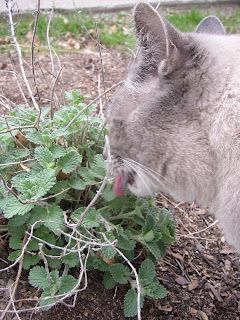 This is catmint, not catnip, but he still seems to be rather enthralled by it. After taking this picture, I went through and cleaned up the old stems for him so he didn't have to work so hard to enjoy his treat. 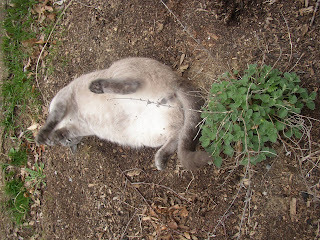 The rolling is not part of the catmint show, however--he regularly begs to have his soft white belly scratched. Silly kitty! I also cleaned up the Japanese maple. Every year, the winter skeleton reveals areas that need a little cleanup... and of course, some twigs die back so I cut them off neatly as well. While finishing my cleanup as the sun set, I found a real treat. 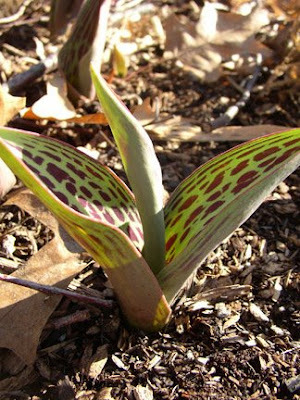 I have been trying very hard to remember where I had tucked the clearance trout lilies that I'd planted back in December. I've been looking for signs of them anywhere and everywhere for the last month. 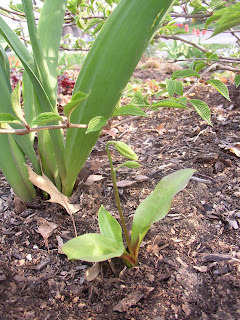 Well, today, I discovered one single, solitary trout lily--with buds!--underneath the doublefile viburnum! Isn't it cute? 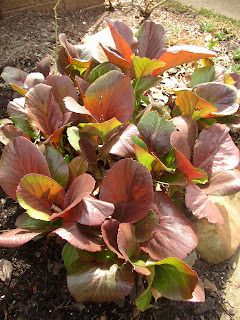 A good reminder, on Earth Day, of the surprises and pleasures we receive from our gardens. 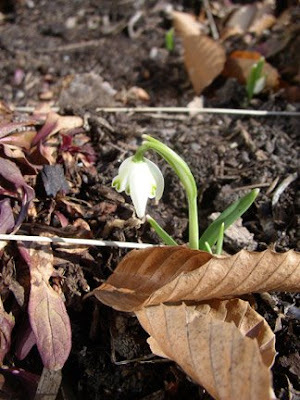 As Carol, founder and matriarch of Garden Bloggers' Bloom Day, noted in her post for this month, spring seems to be running a bit late. At this time last year, I showed pictures of 'Chocolate Chip' ajuga in bud, and added a last-minute picture of a flowering frittilary. 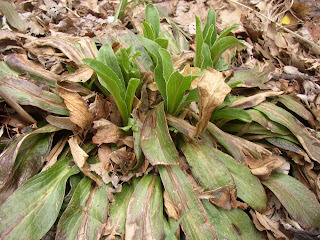 This year, I don't see buds on either... yet. But really, I'm not all that far off from last year. 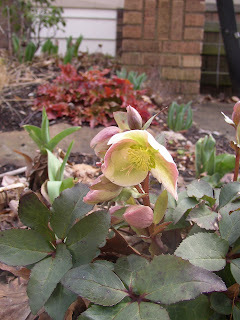 My beautiful 'Ivory Prince' hellebores are blooming, along with their 'Pine Knot Strain' cousins. 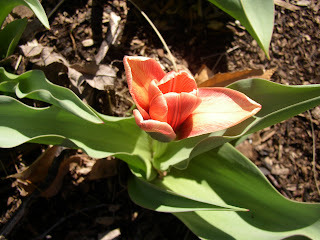 And there is one early tulip in bloom. 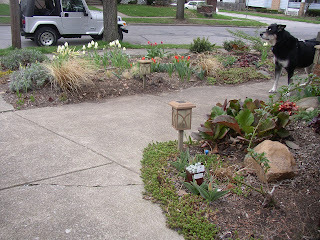 Outside of the aforementioned frit, a tulip and some hellebores were exactly what I had blooming in April 2007. The petite beauty above is 'Shakespeare,' which Netherlands Bulb Company listed as t. greigii on the tag but which I see ID'd as t. kaufmanniana, native to Turkestan, elsewhere on the web. 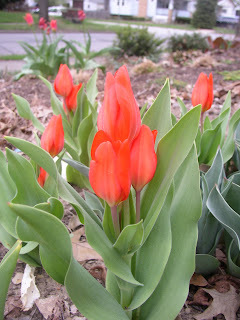 I was initially a little dismayed at the pastel-but-bright orange color of 'Shakespeare,' since all of my other species tulips are supposed to bloom in various shades of red. 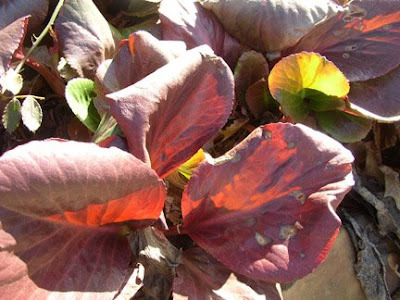 But that quickly dissipated when I noted how well it echoed the color of my 'Peach Flambe' heuchera, and even the reddish tones in my beloved bergenia. Since nothing else is showing much color right now in the front yard, that works for me. 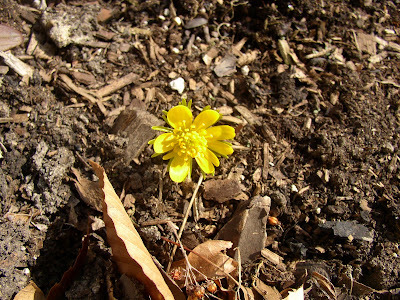 In the backyard, I now have TWO winter aconites and a handful of snowdrops blooming. Lots of other foliage is showing now, too, including 'Geranium' and 'Orangery' daffodils, and the uber-cheerful tulipa tarda. 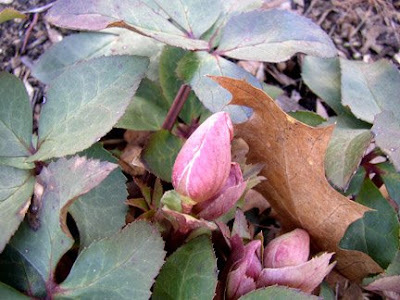 Plants in bud include 3 different cherry trees, more species tulips, and blueberry bushes. 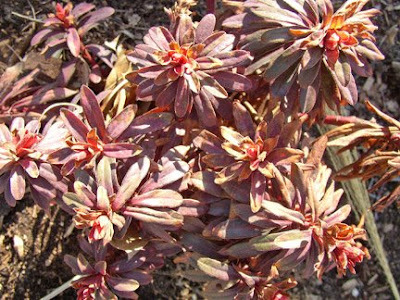 In addition to those flower buds, I have leaf buds on many other plants (including my tree peony) and it doesn't appear at this point that I've lost anything of consequence to a rough winter after a drought-ridden summer. Which is enough to make any northern gardener happy in the spring! As you might have guessed, I don't really think of myself as an overly traditional kind of girl. I'm not as avant garde as I thought I would become when I was younger, I'll admit, but I was rather righteously horrified when I got to college and discovered that more than one of my floormates were simply in college to find a man. "You can't be serious," I remember telling one girl, after I picked my jaw up off the floor, "because... really, Caroline, it's the 90's!" I've never been the type to sit around waiting for my prince, so to speak, so the title of this post is kind of tongue-in-cheek. 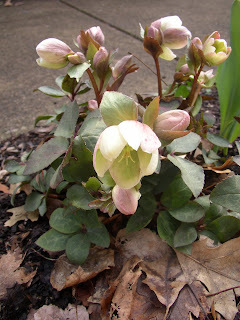 But I'm honestly very excited about my 'Ivory Prince' hellebores. Graham Rice, the author (and blogger, at The Transatlantic Plantsman,) recently mentioned 'Ivory Prince' in a hellebore review for the UK's Daily Telegraph. And everything he said was true. This is one tough beauty. 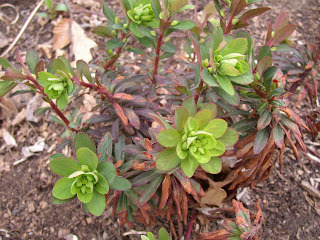 Its blue-green leaves are evergreen (without all of the messy dieback you get from many hellebores) and the form is compact. Mine are in dry, nutrient-deficient soil and suffered through drought all summer--and they're planted where they get midday sun, to boot. How do they reward me for my abuse and neglect? 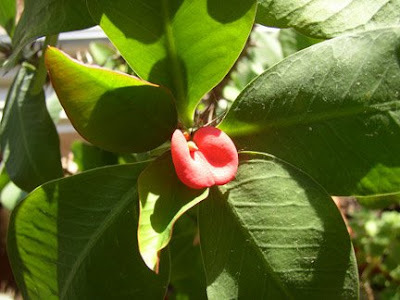 Apparently with dozens of pink buds that open up into gorgeous, creamy flowers in the spring. Amazing. 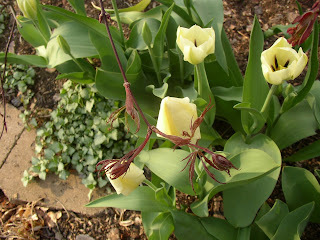 Elsewhere in my garden, some of the foliage from tulipa unknownii (tulips that I don't remember planting) are mingling nicely with a few of the established garden denizens. 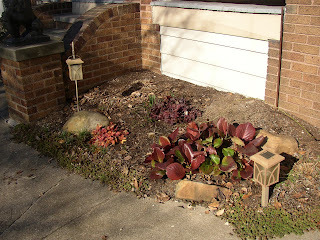 Here you see one clump of mystery tulip adding both color and texture in front of the 'Amber Waves' heuchera... and golden oregano, badly in need of a spring cleanup, skirting another clump. 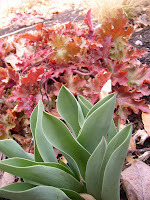 You know it's been a long winter when you find yourself considering growing tulips purely for their foliage! 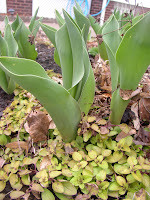 But seriously, some of these compositions are so interesting in the spring garden that I really may not mind if these end up being hybrid tulips that I didn't pull last year, even if they fail to give me any flowers. 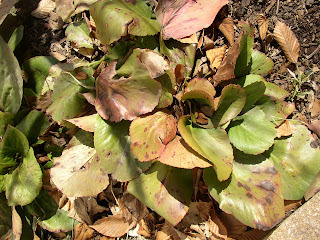 Last, but not least, no post of pics from my front yard in the spring could be complete without a few gratuitous shots of my bergenia! 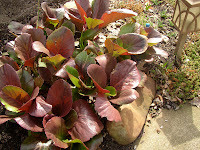 The ugly clump that I showed in a previous post was so horrible that I had to post a good bergenia shot to erase that from your memories. You can see that it's greening up a bit in this week's warmer temperatures... it won't be too long before the red fades completely to a satisfyingly shiny, medium green. And then I'll stop posting pictures of it, I promise! This morning, I grudgingly listened to my still-weak body and called in sick to work. Then I flipped over and went back to sleep for a while. Wake up achey, find a more comfortable position, fall asleep for a while, repeat. Finally, I was out of Gatorade--and out of comfortable positions to sleep in the bed. So I decided to see if the couch might be a better bet, and headed downstairs. 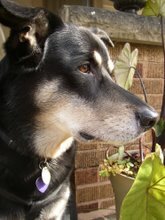 I let the dog out into a beautiful spring afternoon... and decided that I needed to open some of the windows, to help air out any flu bugs that were still hanging out here. My first winter aconite! YAY! 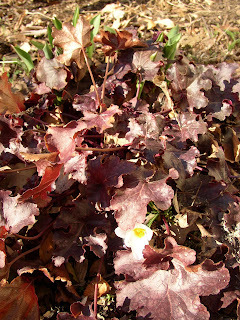 Even the flower stalks on this one are a deep wine color--lovely! 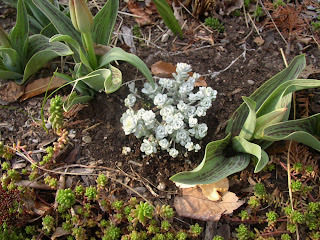 And another began to flower in a fresh, bright green that I'd not seen in my hellebores before, either. 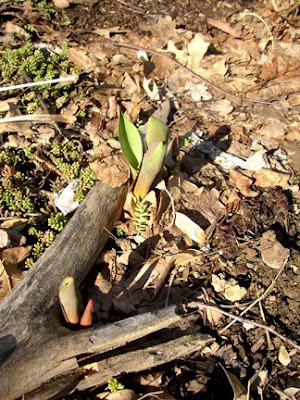 Walking into the front yard, I noticed a bunch of tulip foliage sprouting... even in areas where I don't remember planting any tulips. 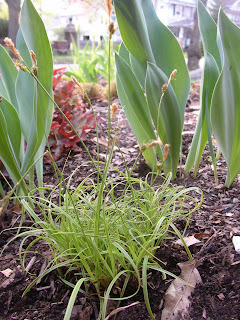 After going back through my bulb planting photographs--er, records--I have discovered that I don't have a clue what I planted here. So much for my record keeping skills, eh? Even the photographic kind is apparently beyond my capabilities. 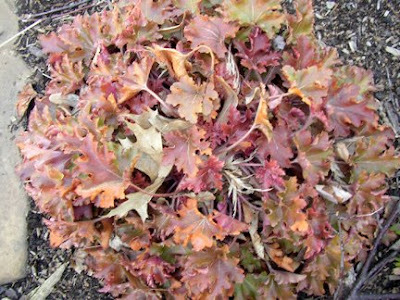 Also with a tough reputation, but looking pretty frazzled, is euphorbia 'Efanthia,' a relatively new cultivar. Her branch tips look pretty vibrant, but the rest of her looks a little winter-weary and dry. She's listed as hardy to zone 7 in some places, and colder in others, so I knew I was taking a chance with her... we'll see whether she snaps out of it with the coming warm spell. This little clump above glows with reds, greens and golds during the morning, and then the clump next to the doublefile viburnum picks up the show in the evening. If you look closer, though, you can see a few spots on the leaf in the lower right, and some crispy edges at the top. All of those will be taken off in a few weeks when the plant greens up... I just can't bring myself to do it now, because I don't want to forego their show! 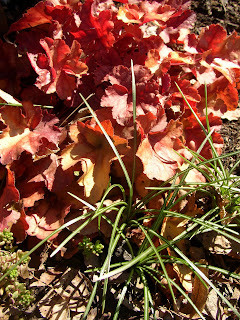 Heading back to the steps, I checked out a few plants that were basking in the morning shade. 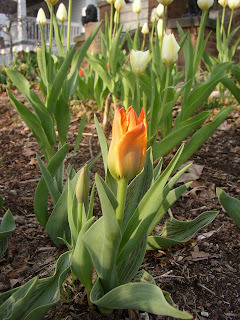 More tulips that I don't remember planting, of course... and then the fat pink flower buds on my 'Ivory Prince' hellebores. 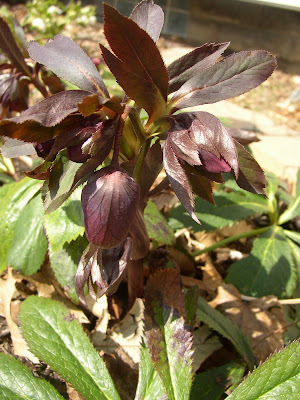 Good thing it's spring, when all colors are welcome, or some stylish gardener might order me an intervention for planting these pastel-flowering hellebores alongside red species tulips--and other taller, showy tulips, too. The almost black 'Queen of Night' and the Orange-with-streaks 'Princes Irene' (which might be my alltime favorite showy tulip) reside nearby with the acid-yellow leaves of golden oregano at their feet. It will be an... interesting... sight if all of these decide to bloom together! 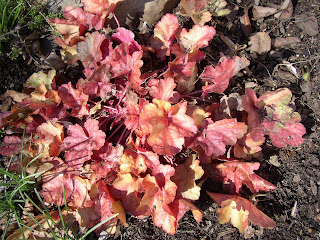 Last year, I fell hard for the new orangey cultivars of coral bells? Which ones, you ask? Well... YES. lol. I'm pretty sure that the one above is 'Amber Waves,' which definitely held up the best of the three. 'Peach Flambe' isn't looking too bad, either, but is definitely on the small side. 'Marmalade,' which you see below, is borderline scrawny but then it gets the most sun of them all and is in relatively unimproved soil. 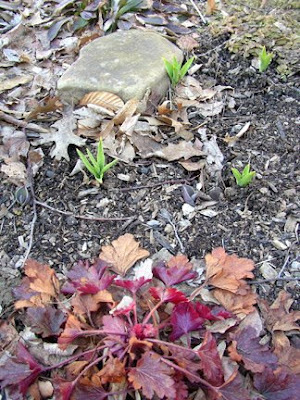 The little green sprouts above the heuchera are the emerging foliage of allium schubertii. 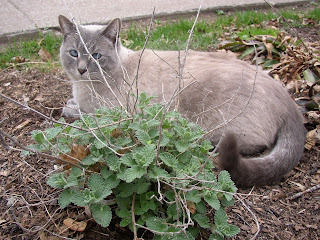 I have planned to allow the golden oregano to creep across the bed toward 'Marmalade,' and thought that the funky purple alliums would be an interesting addition peaking through the oregano foliage.